The case for high-efficiency mini-split air-source heat pumps as an alternative to oil- or gas-fired heating systems. In a recent project, involving the replacement of an old one-bedroom cottage, the common question of (heating) fuel choice for the new structure emerged. The existing house was heated with an oil-fired boiler and cast iron baseboard radiators. Domestic hot water was provided by a coil in the boiler, which was set to maintain year-round (minimum) water temperature of 120 degrees. Though the total square footage would be increased, energy usage was expected to drop due to superior insulation performance of the new structure. Therefore, total energy cost was not expected to be very high. Natural gas was not an available alternative. Cooling was also a requirement, and budget was an issue, so a combined heating-cooling system (sharing ductwork), or even an all-electric mini-split system would likely be viable. Though operating cost was important, up-front (installation) cost was considered to be paramount. above factors, several combinations of fuel — for heating, cooling and hot water production — were considered. Myriad combinations were studied, each with their pros and cons. Propane (or oil) fired hot-air furnace, central ducted system; a cooling coil in the same duct; separate propane or oil hot water heater. Propane (or oil) fired hot water boiler with hydro-air central-ducted heating; split cooling system using the same duct; separate (propane or oil) or boiler-fired hot water heater. Propane (or oil) fired hot water boiler with baseboard radiators, a separate central ducted split (or non-ducted mini-split) cooling system and separate or boiler-fired hot water heater. Electric baseboard heat; Ducted split (or mini-split) cooling; electric hot water. Air-source heat pump central ducted system; split cooling system using the same duct; electric hot water. Mini-split heat pumps, with combined heating and cooling, either combined or multiple systems; electric hot water. Conventional wisdom would indicate a tradeoff between up-front cost, effectiveness and running cost. So, all the above combinations were considered in detail. The result was surprising — and surprisingly conclusive — in that a highly effective system (mini-split heat pumps) had both a low installation cost and low operating cost. The explanation for such a surprise lies in the fact that this relatively new technology is not well understood — and indeed the performance claims may be discredited — by the general public and, in many cases, even those in the heating and cooling industry. The general consumer, and many in the heating industry, tend to rule out electricity as an energy source for residential heating based on its prohibitive cost per unit of energy. Regardless of efficiency (heating elements may be considered to be 100 percent efficient), the operating cost of conventional electric heat is considered to be prohibitively high in normal situations. Heat pumps, however, perform a little magic, somewhat counterintuitive to our expectation that nothing can be more than one hundred per cent efficient. 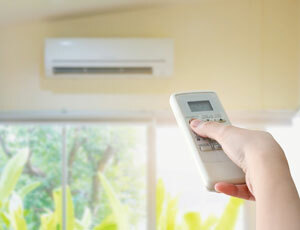 The magic, of course, lies in the fact that a heat pump uses the energy of warm air or water as its source. As a simple example, let’s say the outside temperature is 40F, and we want to heat a house to 70F. A heat pump has the ability to take in two pounds of 40-degree outside air and split it into, let’s say, one pound of air at 70F (which it delivers to the inside of the house) and a pound at 10F (which it exhausts to the outside). The result (the warm and cold air) has no less or more energy than when we started, but the air is free and the house is warmer. There’s more to the technology, humidity and other factors come into play, and the process itself requires (electrical) energy, but this is the basic “magic” of a heat pump. Heat pumps were, for many years, considered to be suitable only for milder climates, and enjoyed widespread use primarily in the Southern States. The efficiency and capacity of the earlier systems dropped rapidly in ambient temperatures below 40F. Over the years, efficiencies improved and heat pumps were designed and produced to operate at lower and lower temperatures. Several of today’s models operate at full capacity in temperatures down to 5F and at close to full capacity down to -13F. A HSPF (Heating Season Performance Factor) of 13.5 which translates to producing 4 Kilowatts of heat for every Kilowatt of electricity consumed! A SEER (Seasonal Energy Efficiency Rating) value of 30.5. Relating to cooling efficiency, this is an unprecedented value in conventional systems, where a SEER 16 system is considered to be super-efficient. Comparing an efficient air-source heat-pump to oil heat, and using the indicated energy prices, the following numbers don’t need much further analysis. Now, to get back to the cottage. Based on maintaining a 70 degree inside temperature during the entire heating season: Per the modular company’s calculations, the total structure heat Loss = 27,000 BTU/Hour (?T=85oF). Energy requirement per heating season = 7,210 x 317 x 24 / 100,000 = 54,800,000 BTU. Four HVACR contractors were asked to look at the project, and to provide pricing. While none were enthusiastic about the idea of using the mini-split heat pumps, one even refused to consider it as an option, based on his opinion that it might not provide sufficient heat in cold weather. Nonetheless, several installation prices were obtained. All electric baseboard is historically considered to be the least expensive installation for heat, but operating costs are so high that such a system was dismissed as prohibitive. And, cooling and hot water systems would also need to be provided separately. The second lowest installation cost was for mini-split air source heat pumps. Even using the high efficiency units analyzed above, the installed cost is lower than any of the hybrid combinations mentioned. Combined with the mini-splits for heating and cooling, an air-source heat-pump hot water heater was installed. Though the installation cost was about twice that of a conventional electric hot water heater, combined with rebates from the electric utility, the installation cost will be quickly amortized in energy savings. It is calculated that this unit will use about 40 percent of the energy as a conventional electric water heater. Based on installation cost, performance effectiveness, and operating cost, there is no doubt that high-efficiency air-source mini-split heat pumps are not only a viable alternative to gas or oil heat, they are likely a superior choice for a wide range of applications. Recognition of the extent of the efficiency of these systems, and their economic advantage, is not high either amongst the public or in the industry. This is likely due to the somewhat counter-intuitive logic of heat pump hyper-efficiency, combined with skepticism of new technology, and lack of incentive on behalf of the industry to change.